This a beautiful large box arrangement with Calla Lilies, Roses and Asiatic Lilliums for delivery to Hope Valley WA for a birthday. For more beautiful fresh flowers for delivery to Hope Valley WA see our Hope Valley Florist Website. We have a fantastic special on this weekend – Rose and Lily Bunches for just $30. Available online or in store. A beautiful bouquet in bright autumnal colours, ready to be delivered to Baldivis this morning. 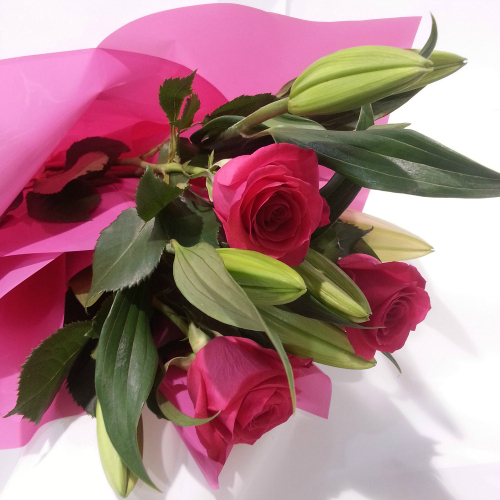 Cute little romantic rose and lily gift ready for delivery to Kwinana. It’s that time of year again – Christmas Lilies. These long lasting flowers open to white trumpet shaped blooms. 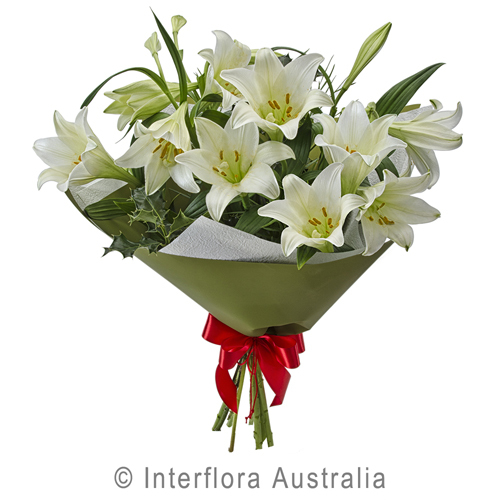 We can deliver a beautiful bouquet of Christmas Lilies any where in the Rockingham Kwinana area – and we are delivering right up to Christmas Eve. Bouquet with Calla Lilies, Roses, Babies Breath and Hypericum Berry, ready to be sent to Kwinana as a birthday gift. One of our favourite Oriental Lillium varieties – Robina – is on special today for $20 a bunch. These large, fragrant blooms have been one of the most popular flowers for many years now. Here is a recent bouquet we created for a wedding on HMAS Stirling, Garden Island near Rockingham. It is a simple and elegant bouquet with Oriental Lilliums, Roses and Ivy. As the bride was overseas until a few days before the wedding, the flowers were organised by consulting with the groom and the bride sending pictures via email – this way we managed to create the very look the bride wanted and she was very happy with her flowers. The ivy, along with the pale cream roses, creates a nostalgic, romantic look while the oriental lilliums add some showiness. Here is a brides trailing style bouquet (also called a cascade or tear-drop bouquet) and a bridesmaids posy from a recent Spring wedding in Rockingham. The bouquets feature Tulips, Oriental Lilliums, Orchids and Tropical Foliage. Brunia is native to South Africa. Like some Australian native flora the flowers store seeds which are released when the plant dies in a fire. These fascinating flowers flowers look great in a bouquet with groups of other large-form flowers like gerberas and lilliums and are well suited to modern floral designs.